Every new crag and rock type brings a unique experience. But one type of rock - granite - is the most unpredictable. I travel to climb. Hopscotching to crags provides a sweet, irresistible variety I crave. I rarely climb the same climb twice (which is probably why I don’t climb very hard), but, I’ve done many-a-climb. As a result of this restlessness and curiosity, I have experienced nearly every type of rock - in multiple settings: limestone, sandstone, basalt, quartzite, conglomerate, schist, tuff/rhyolite, and granite, to name a few. I have essentially become a jack-of-all-trades and master of none. Going to every new climbing area and new rock is like starting over. Each type of rock, and each location, has its own personality. It is, simultaneously, a frustrating and fabulous learning curve - over and over. Although each area is different, some rock has a reasonable consistency in its personality – like limestone. You have they grey stuff, which tends to be sharp, featured with holes and small ledges, and frictiony and the orange stuff, which tends to difficult and overhung. Once you’ve experienced each, you have a sense of what you will get no matter where you are in the world. Joshua Tree, CA – Although crystal size in the granite can vary across the park, JTree granite tends to have sharp, medium-sized crystals consistently distributed across the rock. This can result in the “kitty litter” crumble you often hear mentioned going hand-in-hand with JTree. Certain faces have eroded in a way that you can get fun, plate-like features, but most of the time the rock is balancy slab with intermittent, flaring cracks that make protection challenging. As a whole, the rock is pretty featureless, requiring you to trust the sharp friction of the crystals for your hands and feet. The result is some of the most un-nerving, difficult climbing I have ever encountered. City of Rocks/Castle Rocks, ID – Oh City of Rocks… if there is a granite that would induce poetic soliloquy, this would be it. Solid. It has a smaller crystal size than JTree producing good friction but its not painful. There are beautiful cracks for jamming and placing pro (although there can definitely be runout). The slab has sweet subtle scoops that provide a unique confidence about foot placement. There are tons of featured faces that result in the funnest of moves. I have encountered no other place like it. Columbia Crack in City of Rocks. The best of all worlds - a beautiful crack, a features face, and a little bit of scoopy slab. Northern Sierra-Nevadas, CA – Can you say jugs? There is no shortage of foot and handholds, at least in the lower grades. White Horse – They call the granite bulletproof. 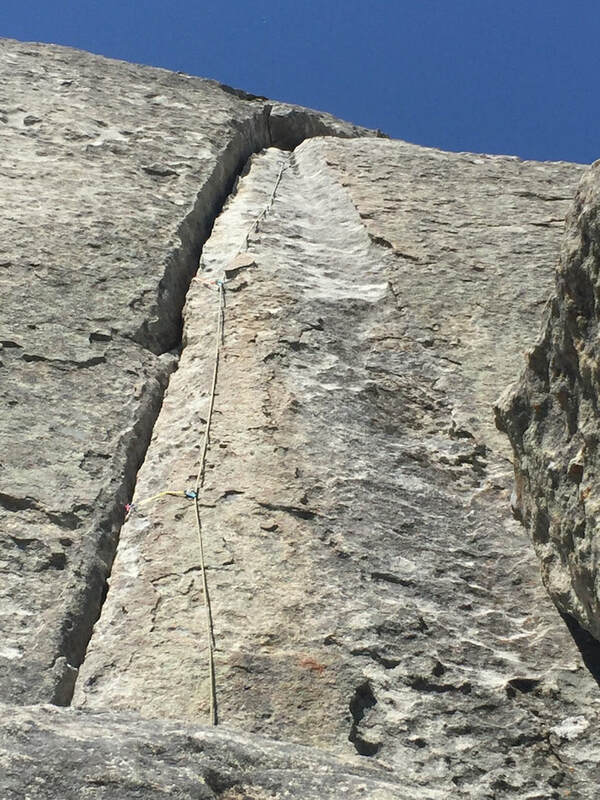 It is some of the hardest granite out there. Although you can see crystals morphed into the rock, that’s just it – the rock is morphed. Super, super solid. The result is a smoother surface that can, at times, verge on slick. Can you say slab? Its all super, super, runout slab. Occasionally some holes show up that give you something to grab and, if you have the right size tricam, place protection. This is, by far, the most runout climbing I have ever experienced. 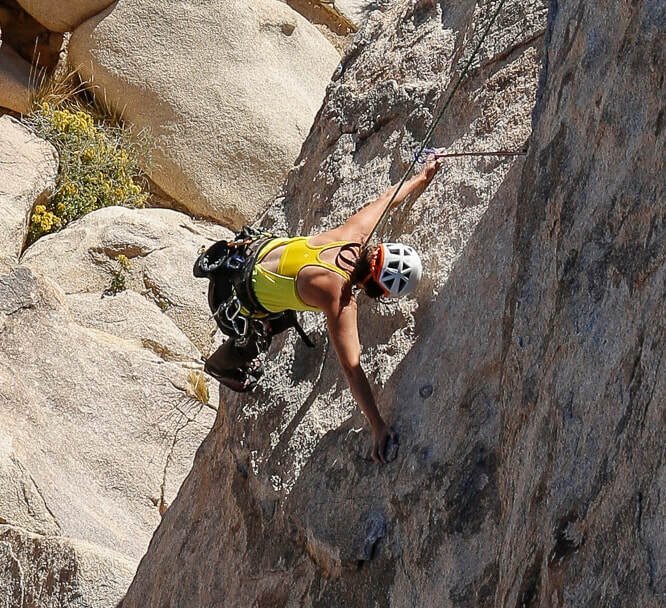 The author leading the most runout climb she has ever experienced - ever. It was 70 feet before the first piece of pro. And the dark streaks were kind slick. Whitehorse, NH. 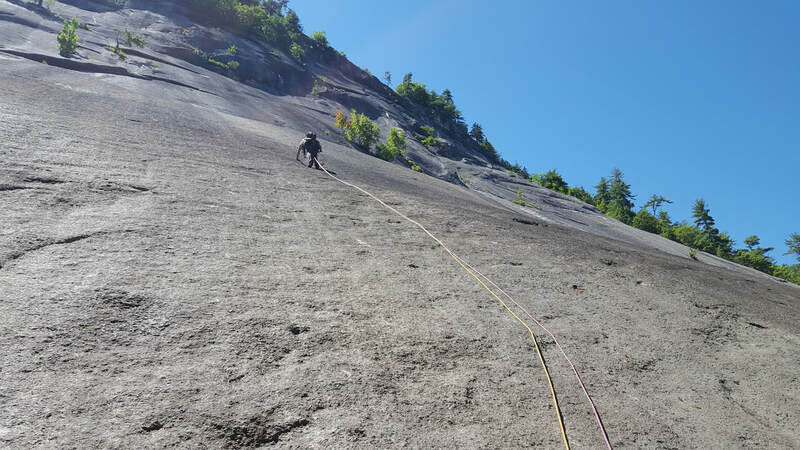 Cathedral, NH – These granite cliffs are literally up the road from Whitehorse, but the style of climbing and rock features are quite different. It’s still super solid, morphed granite, but there are edges for crimpy face climbing. Black Hills, SD – Just plain weird and curiously fun – once you get used to it. When you look at the rock from the ground it looks Dr. Suess-like, weathered into large amorphous scoops and bulges. 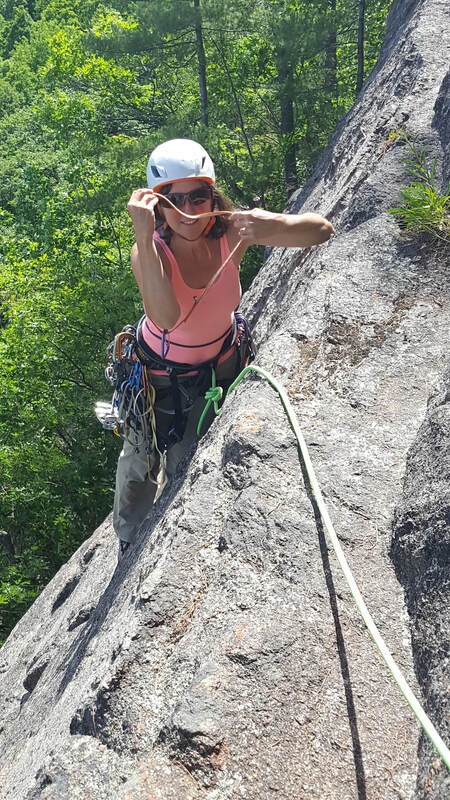 One minute you are forced onto slopers, the next minute you are on odd-angled crimps fashioned from strips of sharp crystal, the next minute you grab onto a huge hand-sized crystal. It forces you to think. It forces you to pull out your bag of tricks. The path is not clear and it looks easier than it is. 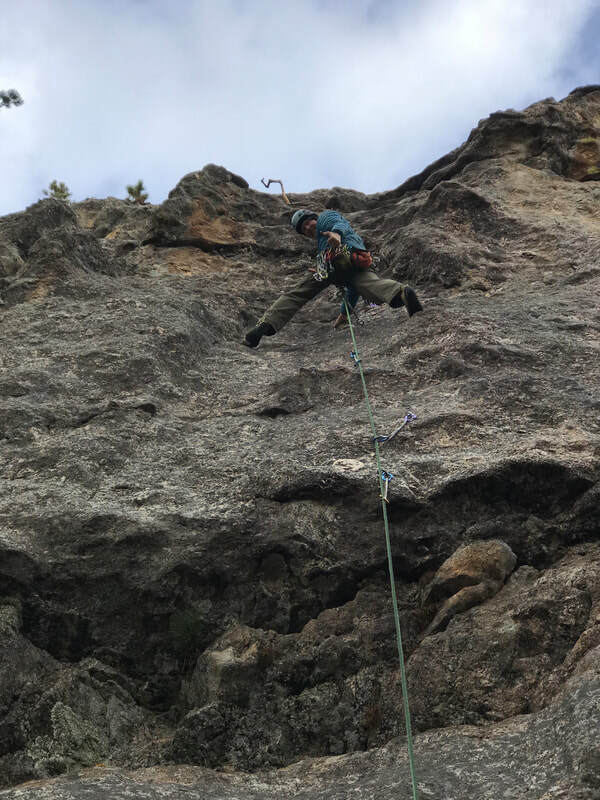 Stef's husband Rick getting the hang of the odd, amorpous Black Hills granite. I could continue – Tuolumne, CA; Little Cottonwood Canyon, UT; Cochise, AZ; Alabama Hills, CA – all different. 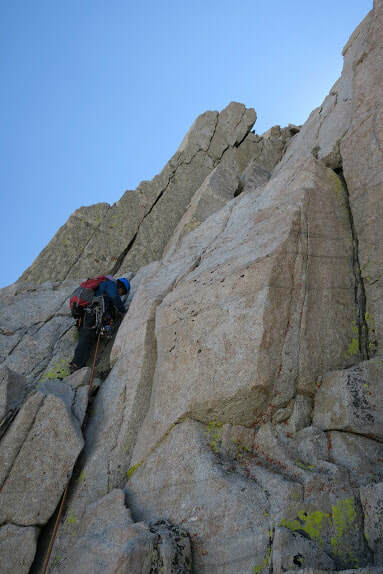 And, although I'm sure you get the idea, I am finding it is challenging to adequately describe the differences in each granite and how that translates to a completely unique climbing experience. Thus, all I can say is get out there, go visit each of these places for yourself and experience what I mean.